Protect your investment! Secure your Tundra® in a truck bed or any other areas where it might be vulnerable with the YETI® Security Cable Lock & Bracket. Our high-strength carbon steel lock bracket is designed to fit into your YETI’s AnchorPoint™ Tie-Down Slots. The 6 ft. long cable, with fully adjustable lock, holds tight at any position and easily threads through anchor points. This product can expose you to lead, which is known to the State of California to cause cancer and birth defects or other reproductive harm. Fits all YETI Tundra Coolers. 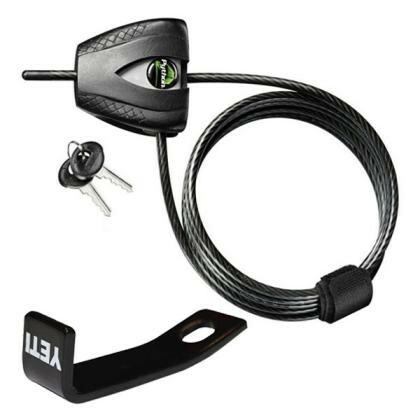 For those looking for an even more substantial theft deterrent solution, purchase the high strength carbon steel YETI Locking Bracket and use the cable or chain and lock of your choosing.